← Hecho … Fini … Gemacht … Finito … Kufanyika … Done! Had to wait until the end of my work day, but am so happy to be posting my award! 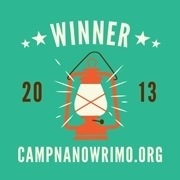 This entry was posted in Camp NaNoWriMo and tagged award, Camp NaNoWriMo, fiction, novel, success, writing. Bookmark the permalink.